York University's 2012 winning rover. The team returns next week to defend its title. SALT LAKE CITY — What does it take to build and command a vehicle capable of exploring Mars? Ninety students from around the world are about to find out. 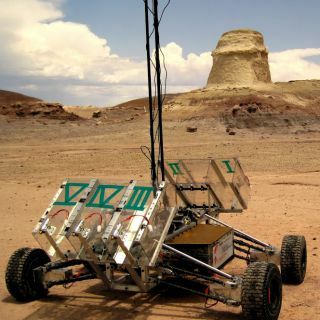 Next week, in a remote desert in southern Utah, 10 teams from the United States, Canada, India and Poland will compete in the annual University Rover Challenge (URC). The competition is hosted by the Mars Society, a non-profit research organization dedicated to promoting the exploration and eventual settlement of Mars. Each team was allowed to spend up to $15,000 on their rovers, which can weigh no more than 50 kilograms — about 110 lbs. On Monday (May 27), the first members of the URC team will arrive at the Research Station to start setting up, Kevin Sloan, director of the URC, told us. The competition will begin early Thursday morning as teams leave their lodgings in Hanksville, Utah (Pop. 215), and travel about seven miles along a road that dwindles to a dirt track. Over three days, teams will use their vehicles to compete in four challenges, designed to replicate the activities of NASA's rovers on Mars. For instance, Mars rover Curiosity, now in its ninth month of a two-year mission on Mars, has recently been deployed to its second drilling site to take rock samples, analyze them for evidence of microscopic life and send the data back to NASA. Likewise, teams will guide their rovers to collect the subsurface soil samples most likely to contain photosynthetic bacteria, lichen and other bits of living material. The specific tasks change each year, but the most difficult ones continue to be those that need rovers to do humanlike work. "Year after year, the tasks that involve manipulation — that is to say using the robot's arm and hand to do meaningful work — really stress the teams' systems the most," Sloan said. "Manipulation from a mobile platform is one of the biggest challenges in the robotics community." Like NASA controllers, team members must guide their rovers via a remote connection, such as a computer in the back of a truck, as long as it's shielded so the team can't see their rovers. The URC is based on the assumption that the rovers are telerobots, which means they would be operated by astronauts on or orbiting Mars. In addition to collecting soil, the rovers will deliver a series of packages, such as emergency supplies to "astronauts" (URC staff) in the field, fix a dust-covered solar panel (without water, of course) and finally, navigate an obstacle course that will include climbing steep grades, getting over boulders and passing through PVC pipe gates, aimed to test each rover's maneuverability. This year's teams represent universities and colleges in Canada, India, Poland and the United States, including two-time returning champions Toronto's York University (2012 and 2009) and Oregon State (2010 and 2008). Details about the capabilities of this year's rovers are kept under wraps by the teams. However, Sloan did tell us he expects one rover to include an unmanned aerial vehicle, i.e., a drone. "Other than that, I don't have any insight into unique system features," Sloan said. "Like everyone else, I'm waiting to be surprised next week in the field!" This story was provided by TechNewsDaily, a sister site to SPACE.com. Follow Leslie Meredith @lesliemeredith. Follow us @TechNewsDaily, on Facebook or on Google+. Original article on TechNewsDaily.